Guess what helps with the wintertime blues? Hot water soaks! January 30, 2019 – Is there anything better than immersing yourself into a hot tub and feeling that warmth envelop you? Well, it turns out that hot water soaking seems to also help reverse depression. A small study in Germany published last year was focused on determining the benefits of alleviating symptoms of moderate to severe depression. In the study, volunteers were asked to soak for a half hour in 104-degree water twice a week. Another set of volunteers were given the task of a 40-45-minute aerobic exercise session. A scale commonly used to measure depression was used to track results. Those that took the soaks found that they had dropped their depression measurement six points on the scale, while those that exercised saw a drop of only three points. And, it took only two weeks for the participants who were soaking to see their results; the exercise group took longer to experience the three-point drop! And—no surprise to me—the folks in the study who took soaks found it easier to maintain their twice weekly soaking schedule (not enough in my book!) vs. the exercise participants, who had more trouble keeping their physical fitness appointments. The researchers conducting the study believe that hot water is partially a substitute for what we experience when we are in social settings that make us feel good. I would think that the endorphin release we get from good social interaction and laughter—which is also produced by hot water soaking—is one of the main reasons. I know that many experience the blues during the depths of winter. While we’re not suffering the bone-chilling dangerous weather that the Midwest and east are being pummeled with right now, the Northwest has its share of people who tire of gray days and it consequently affects their mood. 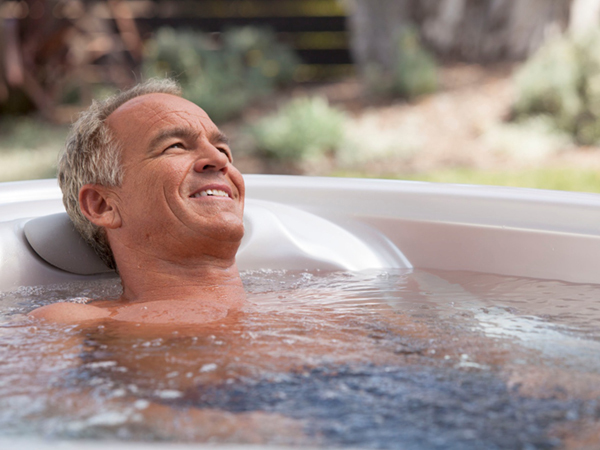 If you have a hot tub, it could be the key to help chase those blues away! And, even if you don’t have a hot tub, you could still reap the benefits with a good soak in a toasty bath. Stress also contributes to depression. Hot water soaking certainly helps alleviate stress! And, if you want something to give some “oomph” to your soak, try Spazazz Stress Aromatherapy. Some Spazazz added to your hot tub or bath water will definitely help with mood elevation, and it smells terrific!